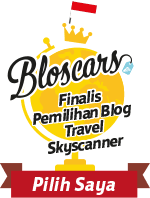 "So here, Hill Cross." Alex, our driver pointed the entrance gate with a thick Lithuanian accent as he turned off the car engine. "How much time do I have here?" After travelled more than 150 km from Riga - Latvia to Siauliai - Lithuania via Rundale, we still have another 200 km to drive before reaching Vilnius. I was concerned about the time in order to arrived on time for a dining reservation. "No worry! Take your time. I wait here." Alex gave me a big grin on his face. "Ačiū (thanks), Alex! See you in a bit." Relieved that I would have an ample time to spend, I leaped out the mini coach before my Dad, Mom and sister. My heart was pounding with excitement. 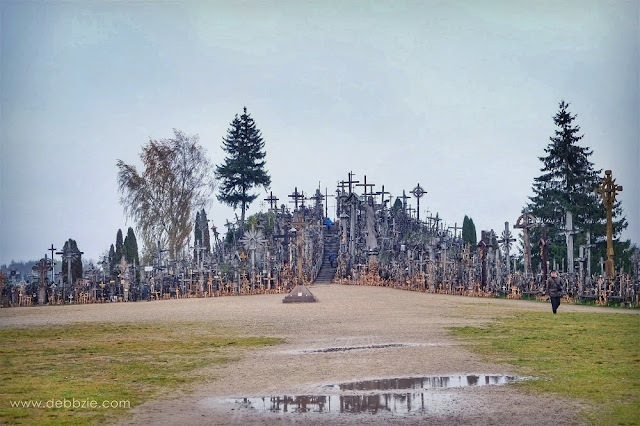 I wanted to visit the Hill of Crosses for a very long time after saw some pictures of it on internet. As I walked closer and the detail of the crosses became clearer, I got goosebumps all over my body. 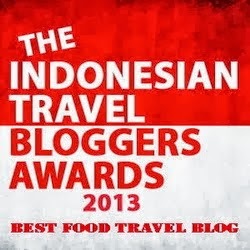 Not because the temperature has dropped to only 2 degree Celsius but I was overwhelmed for being there at last. 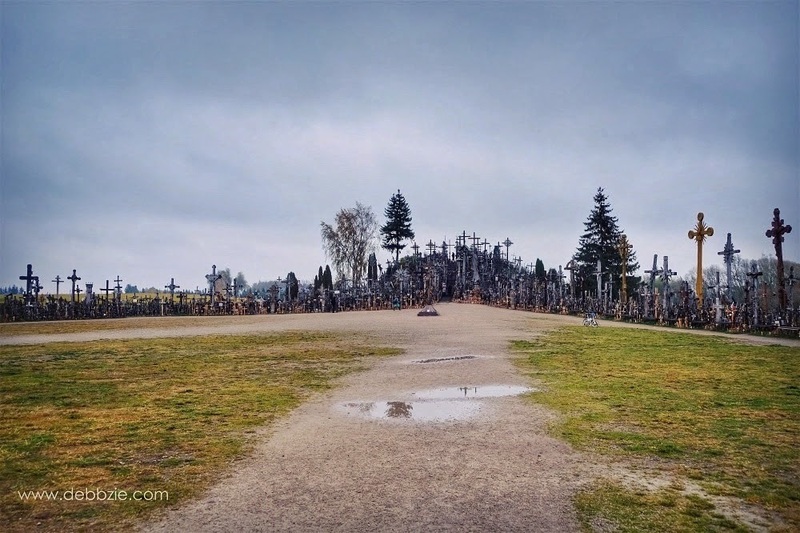 I reached the first cross which was given by Pope John Paul II and I looked around in awe. 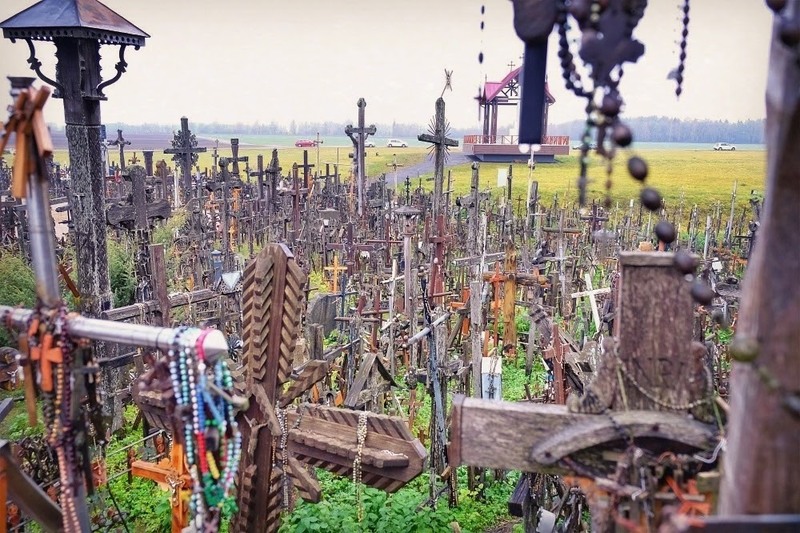 There's tons of crosses wherever I turn my head to. It was quiet because there's only a few people around. Thus the ambiance was rather eerie but not in a scary way. It just felt like stepping into a very foreign land with bizarre yet serene aura. I felt so moved that it brought a lump to my throat. 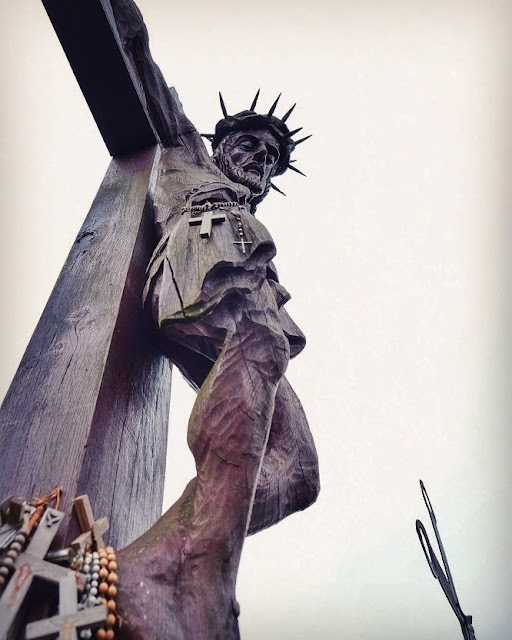 I fixed some small crosses for my loved ones into the wet soil under the big statue of Jesus. As soon as I kneel down to pray, I was already sobbing uncontrollably. It felt like I could finally release all the burden that I've kept for myself. I was too exhausted carving a smile in front of people, pretending everything was alright when it was not. 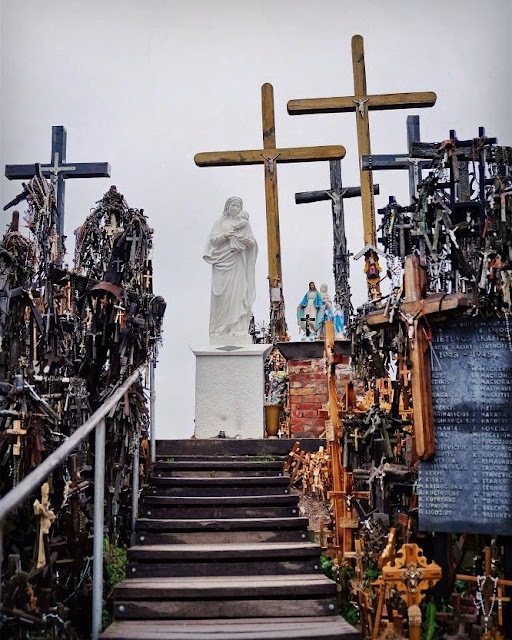 It's hard to describe the feeling of being surrounded by thousands crosses and rosaries in any size, model, colour and variety I've ever imagined. It was mind blowing indeed! I was told that there's even a cross made from Lego bricks but I couldn't find it when I was there. I think it's quite impossible to find out the exact number of those crosses. Some says around hundred thousands and some says it up to millions. 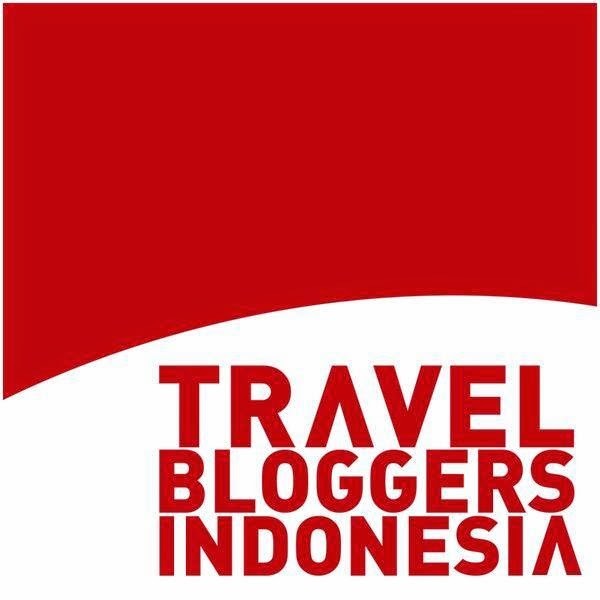 Apart from the information I read on internet, I also enjoyed to hear the story from some locals about this place. There's two versions of how it started in the first place. 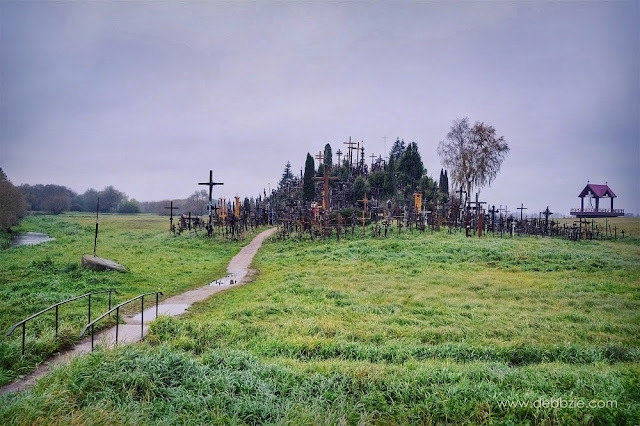 According to the history, the first cross founded on the hill was back in 1800's. It was a symbol of Lithuanian defiances of foreign invaders. Apparently religion was forbidden back then, when Russians occupied Lithuania during the soviet period. As families couldn't locate bodies of perished rebels, they started putting up symbolic crosses on the hill. 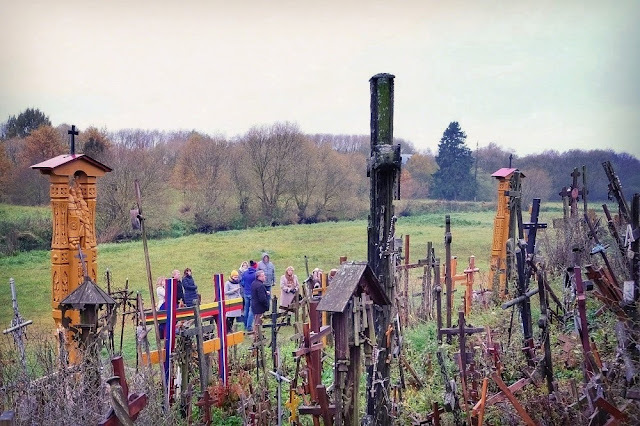 The number of crosses had been increased and by the World War II there were more than 400 crosses on the hill. Sadly the Hill of Crossed had gone through some destruction by the Russian in 1961, 1973 and 1975. To stop people expressing their religion and nationalism, the hill was levelled and the crosses were burned. 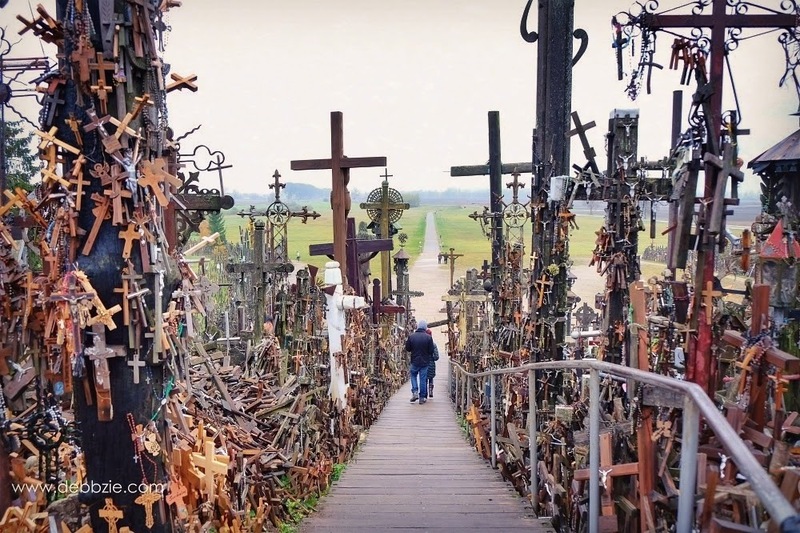 But it doesn't stop people to come and put their crosses here. Specially after the visit of Pope John Paul II in September 1993. 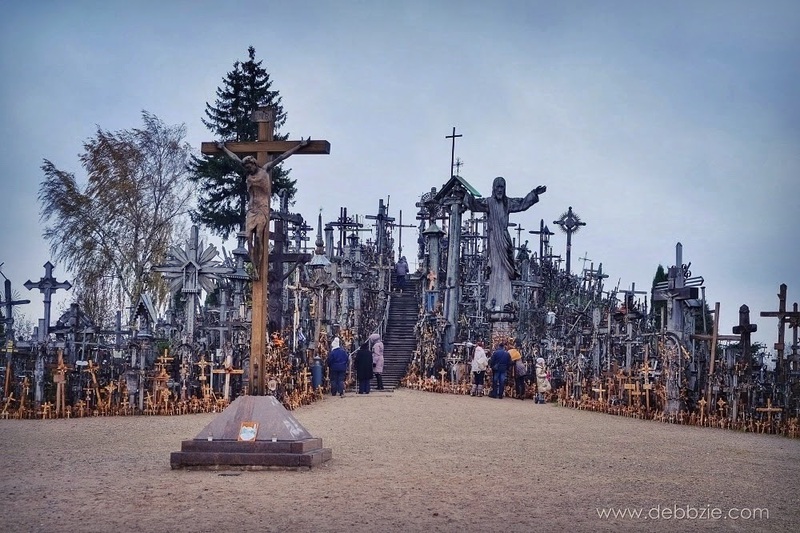 The Hill of Crosses become very well known and every year it is visited by thousands of people all over the world. 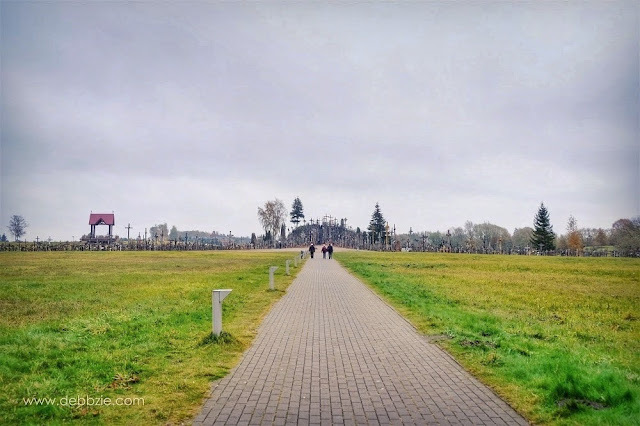 Pope John Paul II declared the hill as a place for hope, peace, love and sacrifice. Another version is, once upon a time there was a farmer who has a very ill daughter. He tried any methods and medicines to cure his daughter but her condition was getting worse each day. He was deeply saddened and felt hopeless. One night in his dream, he met a woman dressed in white. 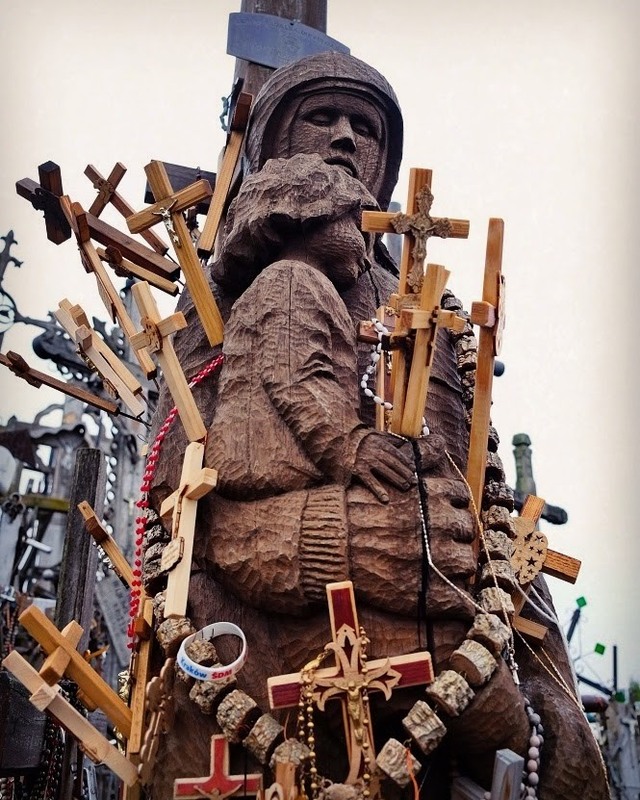 She told him to build a big wooden cross and place it on a hill across the country. The cross would be a sign of faith and love to God; and her daughter would be healed. 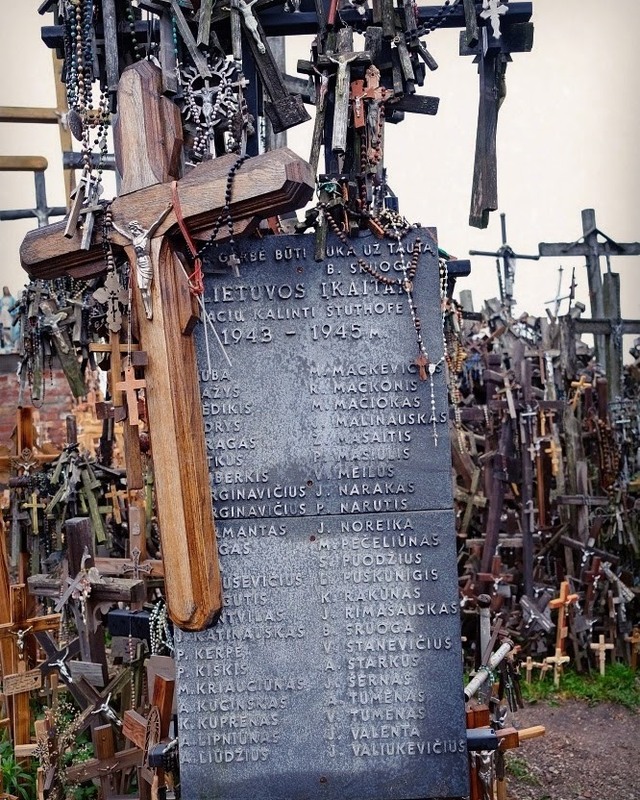 With a slight of hope, he started building the cross and brought it all the way to Siaulai. He erect the cross on the hill and prayed for her daughter. Long story short he returned home and found her daughter was awake and had completely cured from her illness. The miracle story then spread throughout the country and people started to come to the hill and to put their crosses, praying for the cure of their loved ones. 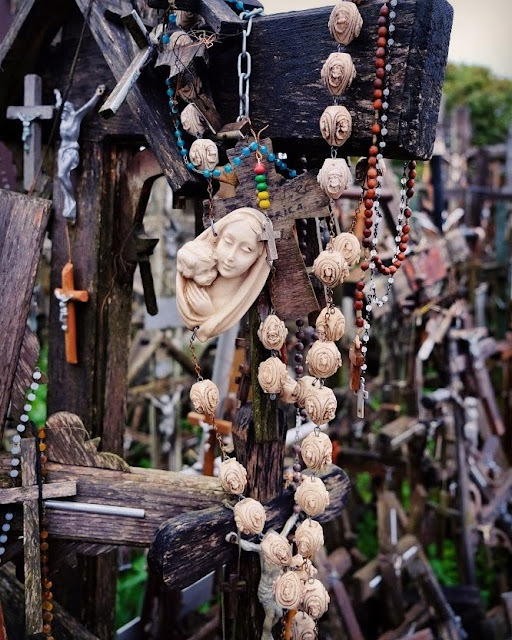 Lithuania is the most Catholic of all the Baltic states and nowadays around 85% of the population are Roman Catholic. Thus this hill is considered a sacred place for the locals. To them a cross is a symbol of love. They believe that in our Saviour's sacrifice, love finds response in one's heart and hopes become stronger. 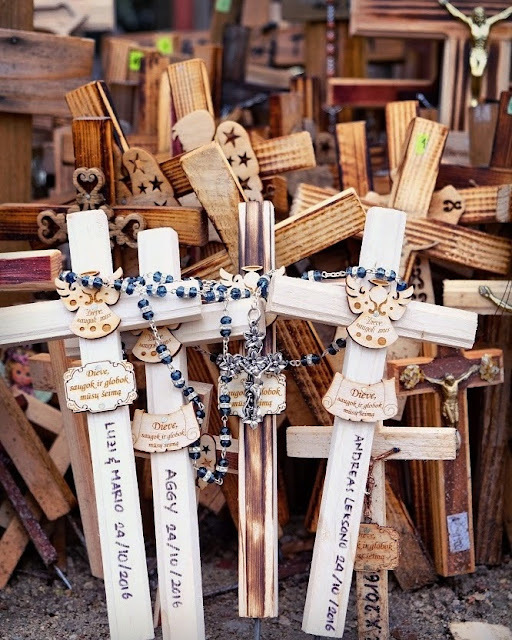 Before visiting the Hill of Crosses, visitors can purchase a simple wooden cross in one of the souvenir stalls next to the information office. 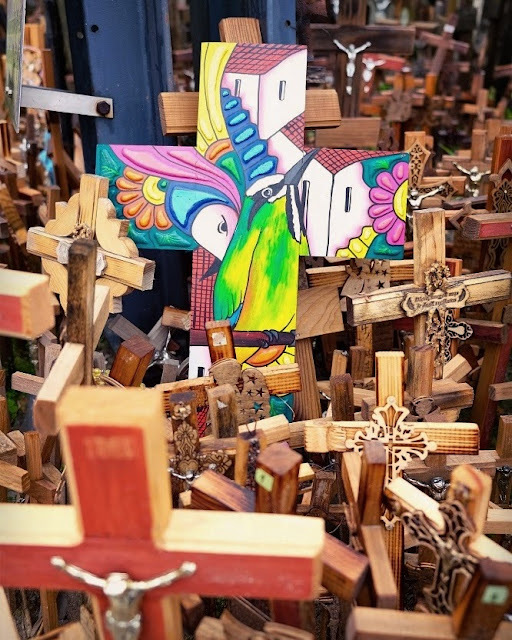 Crosses are available in various size with the price started from 1 Euro. Apart from the religion thingy, it's interesting to learn about the story behind the place. 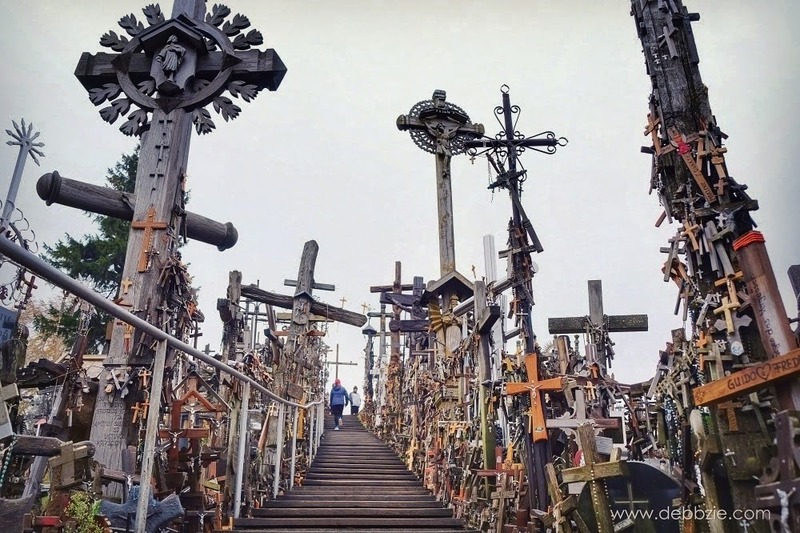 Also my mind was overwhelmed with the thought that each crosses symbolise a hope for someone out there, for many different reasons of what their wishes or prayers for. And there are millions of them in many languages from all over the world. It was almost dark when I walked slowly towards the parking lot. Half way through, I turned around and gave the last glance to the crosses from afar and whispered "May all their wishes come true." The Hill of Crosses can be visited at anytime of a day, all year round. However, visitors are forbidden to light candles or to smoke in order to avoid a fire hazard.